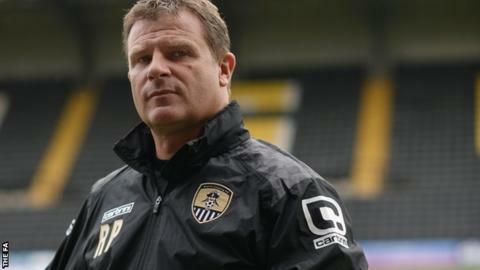 Notts County have lost control of their Women's Super League One title hopes, admits manager Rick Passmoor. In a costly week for the Magpies, on Wednesday they lost to bottom side Bristol Academy, just four days after losing the Women's FA Cup final. That defeat by the Vixens leaves County four points from the summit with four games left, having played one game more than everyone above them. "We are now hoping that other teams mess up," Passmoor told BBC Sport. "It has been a bad few days for us, but as a leader of this team I'm very proud of these players." Notts County Ladies are now on an 11-day break in action, returning to Meadow Lane on 16 August to host Bristol Academy once again, in a Continental Cup fixture. Before last week's Cup final loss to Chelsea , Notts harboured ambitions of a domestic treble and a first appearance in Europe. But a run of just one win from four WSL matches since the nine-week World Cup break means they have had to reassess those hopes. When asked it a top-two finish and spot in the Champions League was beyond Notts, Passmoor said: "We are relying on other teams if we want that. "If we can relax and get back to our core values and work our way back into it, there is no problem with a top four finish. "In the Continental Cup, we want to be there. and in the league, we want to have a say in what happens."